Size : 13.8 x 18.9 inches. / 35.1 x 48.0 cm. Description :In 1587, a new plate was engraved which appeared in editions from 1588 onwards. Of the three maps, this one is perhaps the most important. It is the most geographically advanced one, with the bulge in Chile removed, the Salomon Islands inserted and additional names, including C.Mendocino, added to the north west coast. 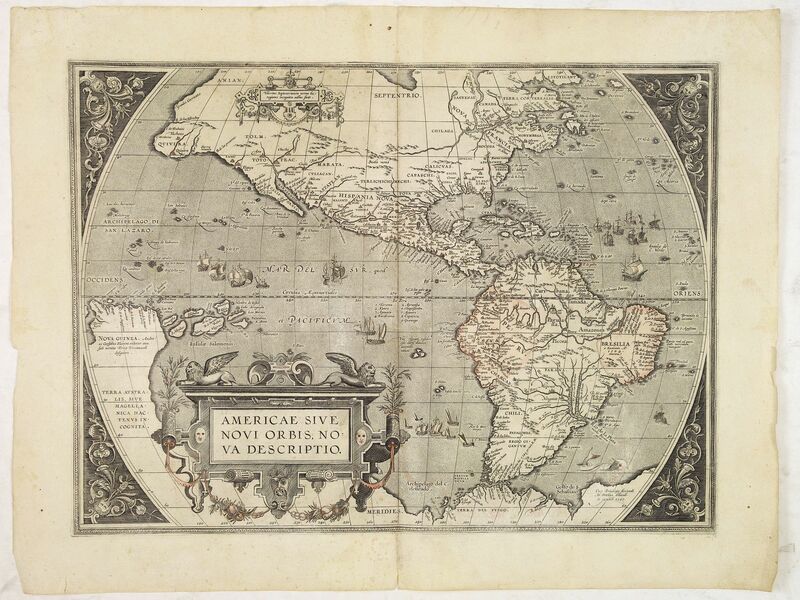 Furthermore, this is the only one of the three plates which is signed by Ortelius as responsible for the preparation of the map. Broecke, Ortelius 11., Burden 64. Condition : Paper very slightly age toned. Two tiny holes in center fold filled in. In very good condition.